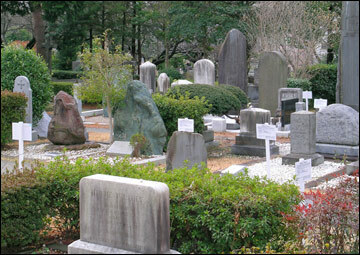 Help preserve Aoyama Cemetery's foreign section. The Foreign Section Trust celebrates the international community's role in Japan's history and helps preserve a record of individuals' activities and achievements. View close up of the area. WHAT TO BRING: Your favorite food and drink and a cushion. If you are coming in a group, please bring a ground sheet and, in any event, help to clean up before you leave. 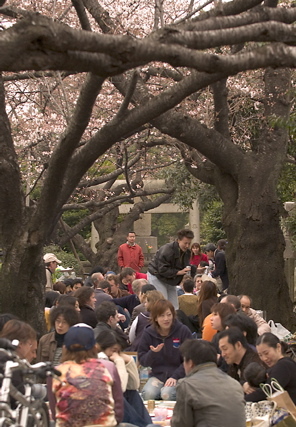 The 2008 hanami is scheduled for Sunday, March 30, a bit earlier than last year's. It will be in the same location, near or under the early blossoming tree. What to bring: Family and friends, your favorite food and drinks, and a cushion, if you want to sit comfortably. Rain Date: There isn't one. Bring an umbrella! If you have any questions, send e-mail to me: jonathan at foreignsection dot org. Would also appreciate you letting me know if you will attend. Information about the Foreign Section has been etched into a new metal sign to the left of the memorial stone. The text at the top of the sign. A higher resolution picture is here. A list of important people and their location in the Foreign Section is on the bottom left of the sign. A higher resolution picture is here. A map of the entire Foreign Section is in the bottom right of the sign. Higher resolution picture is here. This map replaces the old map. Notice that although the layout of the plots is essentially the same as in the the old map, the old one has the names of the important people AND "unimportant" people. This erasure of the "unimportant" people from the public record is of concern. A letter requesting approval for the establishment of the Foreign Section to the Central govt. from Tocho and the central govt's approval is in the middle of the sign. A higher resolution picture is here. The second round of construction will improve visibility and access to the plots and stones through the removal of greenery and benches, and laying of cement walkways. The construction will be completed at the end of February 2008 at a cost to taxpayers of nearly 45 million yen. See a close up of the sign. This view is of a space that had a bench and was full of bushes right next to the spot where we hold hanami. We'll just have to wait and see what it looks like in early April when the cherry blossoms open. Tocho officials unveiling the monument commemorating the achievements of the foreigners who came to Japan in the 19th and 20th century. 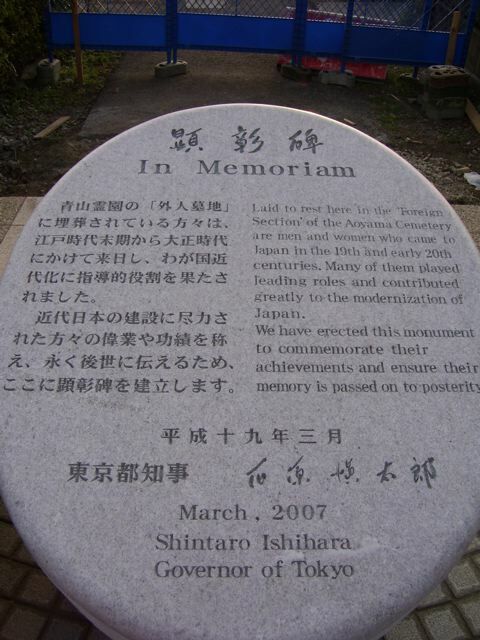 The dedication ceremony commemorating the contribution of foreigners to the modernization of Japan was lightly attended by about 20 relatives and friends of the deceased. The ceremony ended with a distribution of souvenirs. Trees in full bloom in the morning of the 2007.4.1 hanami in the Foreign Section of Aoyama cemetery. Although the construction was finished, as you can see the ambiance was marred by the barriers which had been left up. Our tree had passed its peak, and was showering us with its delicate pink petals, but the trees nearby were in full bloom. The backside view of the monument re-wrapped. The ceremony for the unveiling of the monument will be held on April 4 at 10:00 a.m. We've been told that those who are paying the fees for the plots have been invited, but Governor Ishihara will probably not attend. The 2007 hanami is on for Sunday, April 1 and we hope you will join us near or under the tree that blooms early. While "the tree" will have already lost many of its blossoms, there are sure to be others peaking in the vicinity, affording the proper ambiance for revelry and reflection on the bittersweet transience of both cherry blossoms and life. If you have any questions, send e-mail to me on fst at foreignsection dot org. We hope to see you there. Debris litters the "Foreign Section" construction site as the facade nears completion. Memorial is in the center of the frame behind the pair of orange cones. Here is a close up of the monument. The sentiment somewhat fits with what we have been saying on this website, however, we note that Tokyo Governor Ishihara has killed two birds with one stone at taxpayer expense: he offsets his well-documented racist remarks directed at foreigners living and working in Japan, and at the same time sets the groundwork for future bureaucrats to remove graves. Removal of bushes and stonework in preparation for construction of a viewing platform and Ishihara's proposed memorial started sometime in the week of JAN 22, 2007. Below is a before picture, not quite from the same angle as the above, but the street light in both pictures is a good reference point. Coincidentally, there is an article (republished in pdf with no permission and for no monetary gain) in today's The Japan Times on the fate of another park in Okubo that eerily echoes what has happened -- the voice of taxpayers left unheard while those of associations were heeded -- and what may be in store for the Foreign Section. Briefly, the removal of bushes and benches is also to make it difficult for homeless people to move in. As far as progress in our communications with Tocho, in response to the earlier explanation below and the above addition, a letter has been sent, which will also appear in its entirety with the English version here soon. In addition, a press release is available upon request. Tocho's plan is to create more parkland in Tokyo by refurbishing Aoyama Cemetery. They are now executing their plan to repurpose the cemetery and will turn the Foreign Section into an attraction in the cemetery. Specifically, Tocho plans to renovate the area between the sidewalk and the first row of plots to create a viewing platform from which visitors can see the gravestones. Because the land slopes downward into the Foreign Section, the platform will require a protective barrier, steps and ramps to provide access to the cemetery. They will try to use materials that look natural. Building the platform necessitates the removal of the bushes along the sidewalk. In addition, bushes and trees within the Foreign Section will be removed so that when people snap a photo they will get pictures of the stones, not shrubbery. Tocho plans to plant grass where trees and bushes are removed. The land where the platform is proposed (as well as some other areas within the Foreign Section) is owned by Tocho, so they do not require permission from plot owners to remove the sidewalk bushes. They have notified owners of plots whose greenery may be removed and have received no complaints so far. Perhaps people using the graves will be happier without trees and bushes because they won't need to remove dead leaves. Tocho doesn’t know which trees are from the Meiji era, but says that some of the trees and plants will be replanted elsewhere in the cemetery and the remainder will be turned into chips or fertilizer. Tocho is going to make a new sign about the people in the Foreign Section, but they know not when. A pamphlet about some of the famous people in Aoyama Cemetery was made last summer. Further "software things" are under discussion, but no decision has been made about funding historical research, or if the historical information could be disclosed. Tocho added that there is a regulation giving Tocho the right to remove stones, graves, and bones if maintenance fees are not paid for five years, but Tocho decided in a meeting that they would not remove any gravestones from the Foreign Section when the right to use the land reverts to Tocho. These meeting minutes exist, but they must be requested through a "freedom of information form.” We requested meeting minutes via the form, but our request was denied. Tocho explained that the only way to temporarily stop the construction is if a bomb is found on the site, or if a politician talks about it in the Diet, or many people demonstrate in front of the office in charge of construction. This bird's eye view of the Gaijin bochi shows that virtually all of the bushes and some trees will be removed. We understand that this is to provide an unobstructed view of graves, which in of itself is not necessarily a bad thing, but we believe the charm of the cemetery will be lost. We urge you to write to Tocho and Governor Ishihara to call for a halt to these plans and preservation of the site. 2) Governor's snail mail: Governor Shintaro Ishihara, 2-8-1 NishiShinjuku, Shinjuku-ku, 163-8001. Details from TUE's meeting are forthcoming. The last four months of 2006 were uneventful, yet a bit frustrating, because it was only after repeated requests for documentation on Tocho's plans for the Gaijin bochi that they finally released the drawings for the budgeted construction. The release of the plans came AFTER Tocho issued a tender, received bids and chose a contractor. The artist rendering shows that bushes will be replaced by what appears to be a facade that is intended to raise the visibility of the Gaijin bochi. A monument and low wall will be constructed and cement and tile laid. What you can't see are the planned steps and ramps for wheelchair access leading into the foreign section just behind the monument and what might be inscribed on it. We recognize that the construction plan is in line with Tocho's promise not to move or remove graves for the time being, but the planned construction makes the cemetery less green, and provides for no historical preservation. Here is our response to Tocho's plan in English and Japanese. Below are links to the Koho, which among other things, contains documents listing plots in the Gaijin bochi reverting to Tocho. The first document contains one name and the second 58. Our updated database is here. The plots reverting to Tocho are marked in lavender. 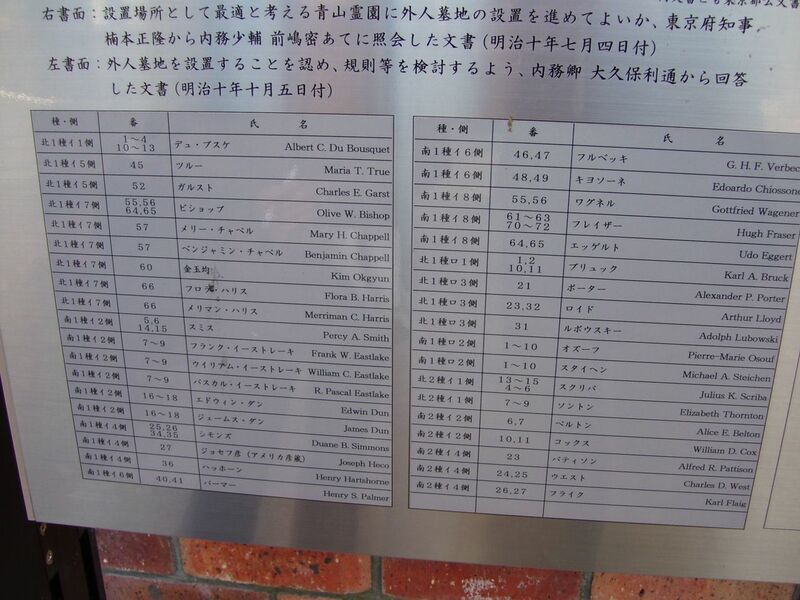 The 59 names are of those who originally leased plots in the Gaijin bochi and have not paid maintenance fees for more than five years. After cross-checking the names in the Koho with those in our database, we can construe that there are at least 68 deceased whose stones and/or remains can now be moved or removed by Tocho. The good news is graves of 43 individuals have been saved. However, Tocho has said that they are not going to remove any graves for the time being. We continue to seek more information on the construction plan for the Gaijin bochi and will update this space as soon as we have them. Our tree was in full bloom, and the weather cooperated. Thanks to the forty of you who attended over the course of the day and made the hanami a memorable one. See the pictures here. Deep apologies to those who never made it into any of the photos. Thanks also go to Jeremy and Tateda-san for their contributions to the gallery. event the weather looks bad. An impromptu gathering for all those interested in preserving the foreign section of Aoyama Bochi has been scheduled in conjunction with the customary grave visits and the Autumn Equinox. Come get some fresh air, put some faces to the names, and stroll around. To let us know that you are coming or for more details, send us mail: fst@foreignsection.org . Feel free to spread the word. this page, at the botom of the sidebar on the left. Many, many thanks to Noriko Tsuda for volunteering many, many hours of her time to bringing the Japanese site to life. To listen to the interview and see the accompanying notes, please go to http://hanashi-station.org . Everyone is welcome to drop by on an informal gathering in the foreign section planned for Saturday, June 4 @ 2:30. Andy will be leading a fact-checking mission and welcomes others to assist. Jonathan will be recording a podcast interviewing Donatella Failla, head of the Chiossone Museum in Genoa. Will also interview others that are present on their interest in preserving the foreign section. If it is raining intermittently, we will go ahead with the plan. If it is raining heavily, Sunday, June 5, 2-ish will be the rain date. Now that the board has the NPO application ready to submit, we are putting together plans and teams to work on our projects and goals. What else can you help with? The options are (almost) limitless. If you don't see your favorite thing on this list, suggest it! Send a mail to fst@foreignsection.org if you want to jump in to help. The paperwork for the establishment of the NPO, the Foreign Legacy Society, is just about ready and Jim O'Connell has kindly agreed to host the meeting to formalize the organization. Our organization exists for the good of the general public, both in Japan and abroad. Through our activities, we aim to increase awareness of foreigners' contributions to Japan's history and aid in enhancing mutual understanding and cultural relations between Japan and other countries. We will actively seek opportunities to pass on and protect their legacy. What to bring:	Your favorite non-alcoholic beverage for consumption during the meeting; alcohol and snacks for consumption afterwards; and your own copies of all relevant docs which will be posted online by Sunday afternoon. Let me, fst at foreignsection dot org, know if you can attend either in person or via audio/video (ichat or skype) and I'll be sure you have access to the relevant docs in advance of the meeting. Cheers and looking forward to seeing everybody on Monday. In addition to the threatened graves in Aoyama Cemetery, Zoshigaya Cemetery (located in Toshima-ku near Ikebukuro) plots have also been served notice. The payment of fees at Zoshigaya was due on September 1, 2004. Although none of the graves have been moved since, it seems as though many are still marked--signs were removed, but the numbered posts remain. 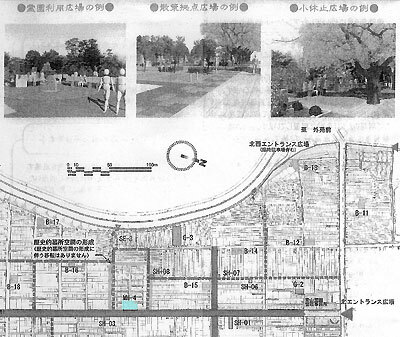 A phone call to the Zoshigaya Cemetery office indicated that there are no immediate plans for selling plots, removing graves or creating a park. The FST will include these graves in its scope, and begin a dialogue about them with the city and with the University to see what we can do to preserve them. For the first Foreign Section Trust O-Hanami, the prime spot was secured under the cherry tree that blossoms early every year. About 60 people attended from 11am to 7pm. About 10 stayed until 10pm. Apologies for not getting good pictures of everyone. Update: The hanami will be happening tomorrow, April 2. While we may not have today's sunshine, it doesn't look like we'll have rain, so please join us for what will be a very pleasant and convivial appreciation of the cherries, the bochi, and the sweet transience of life. We hope to see you there. Please join the Foreign Section Trust for a relaxing day of eating and drinking under the cherry blossoms. 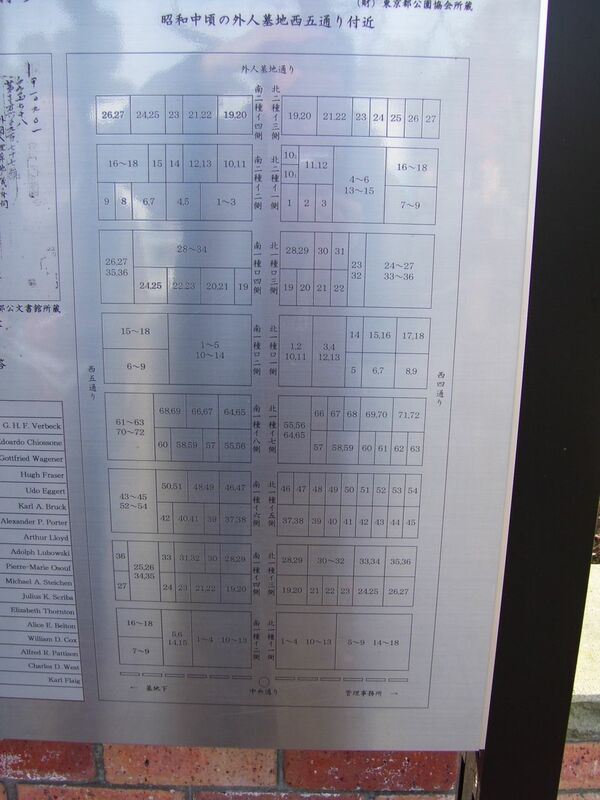 We also invite you to stroll around the section to get acquainted with the historic significance of the foreigner's section of Aoyama Cemetery. FST members will be on hand to discuss the city's plans to replace part of the cemetery with a park and how you can get involved with the urgent task of preserving this piece of Japan's history. 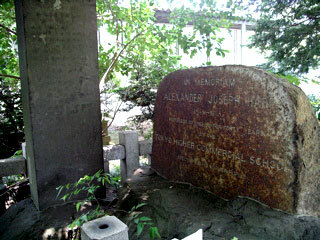 Place: Under the cherry tree at the the south end of Aoyama Cemetery's foreign section. For more info contact fst at foreignsection dot org. The plans incorporate parklets into the cemetery. To follow up on the 2/21 fact finding mission, Sachiko, Stephen, and I went to the 23rd floor of Tocho to meet with Minowa-san and Hayashi-san in Kensetsu-Kyoku Koen-Ryokuchi-bu Reien-ka, Bureau of Construction of Parks, Green Areas and Cemeteries. The upshot is the Foreign Section Trust is making headway toward persuading the authorities to treat the foreign section as an historical site in its entirety and establishing a constructive relationship on how this can be achieved. They suggested that the relationship could take the form of a liaison between families and the cemetery management office, but more importantly, the door to providing a “safety net” for unclaimed graves could be opened via an NPO. Falling into that net are the graves not claimed by family, or deemed not important enough to save by the government, or the some forty graves listed as unknown by the city, half of which have been identified by us. Their suggestions, of course, are subject to the vagaries of the city’s bureaucracy and plan to consolidate the section to make way for a park, but the formation of an NPO is clearly the path to achieve the FST’s aims. The meeting with the lawyer, Stephen, in Ark Hills was very beneficial in that it highlighted some of the legal constraints we may be forced to deal with while pointing the way to the larger strategic direction we should take. The upshot of the meeting was that we need to grow awareness and support for the cause upwards to create a group of prominent Japanese citizens whose eminence in their fields causes the city to pay attention. Framing the cause firmly as a Japanese historical issue is essential to avoid the perception that (a) this is just about protecting foreigners' graves, and (b) that this is just a foreigners' issue. We need to ensure that we're seen as wanting to preserve an important piece of Japanese history, specifically Meiji history, when the country was first opening its doors to the West and when it borrowed heavily from foreign expertise in the development of the country. The following people are listed on the Kampo for not having paid their debts. There is a total of 71 known persons. According to the Kampo, there are 126 names that are unidentified. From this group, Andy counted 39 "unknown" markers on the graves, however there is the possibility that the cemetery has made mistakes, so the number could be as high as 41. From this list, he was able to identify 21 graves, leaving the total number unknown of 20. The following is a list of the known "unknowns". 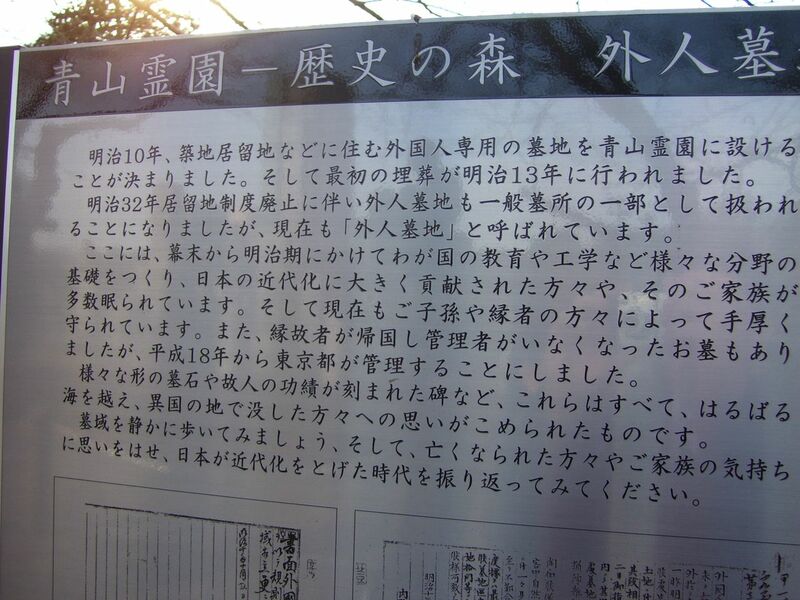 This is the text of the notice placed on the graves at Aoyama Cemetery. Thanks to Andy Edsall for providing the translation. In order to maintain the cemetery, unattended graves will be reburied. Persons with a rightful connection to the deceased and the grave are asked to please contact the office listed below within one year from the date listed below. In cases where no one comes forward during the timeframe, please understand that the remains will be considered unattended and subject to reburial. 1) get a a map (preferably a surveyor's map) of the Foreign Section. 2) get the list of the "served" tombs and what is owed on each one. 3) announce the intentions of the Foreign Section Trust. From the Management office, we obtained a map (a clean copy of this one) and enough information about how the plots are divided up to make guesstimates on what could be owed. 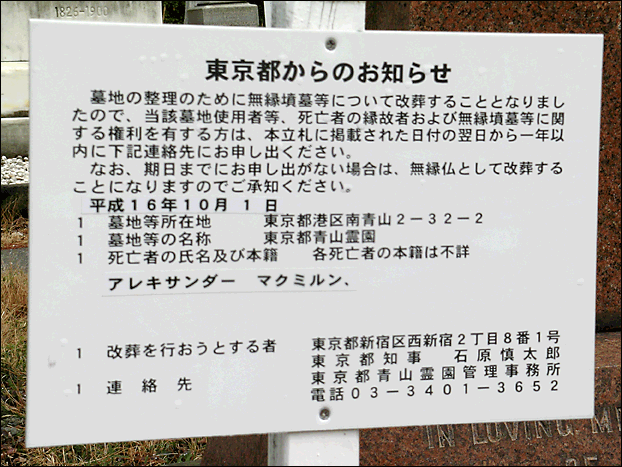 According to a February 19, 2005 Yomiuri Shimbun article, the Tokyo Government has served notice on scores of tombs in Aoyama Cemetery's foreign section: have their maintenance fees paid by October 2005 or face removal. Concerned about what this means for a particular slice of Japan's history, we have formed a community action group, the Foreign Section Trust. 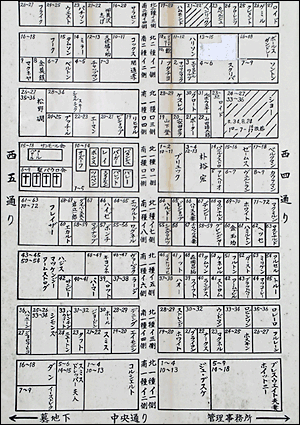 Its first project is to preserve the foreign section of Aoyama Bochi. It also aims to preserve and acknowledge the history of the expatriate community's contribution to the development of Japan. The Foreign Legacy Society is a pending NPO. Until the application is processed and approved, we will “do business” as the Foreign Section Trust an unofficial group. Be aware no one can engage in activities under FLS auspices, as the auspices don’t exist. Any infringement of this could cause the NPO application to be rejected.